Nikos Paragios is professor of mathematics at University Paris Saclay, and CEO/CSO of Therapanacea. Prior to that he was director of the Center for Visual Computing at CentraleSupelec, scientific leader at Inria's Galen Research Group and affiliated with Siemens Corporate Research as a corporate amnager, senior researhc scientist and reseasrch scientist. Paragios is the European Research Council GRantee and laurate of the Bodossaki Prize, a prestigious scientific award for young scientists in Greece. He is member of the scientific council of Safran Conglomerate, member of the advisory board of the Data Healthcare Institute and member of the academic research council of the Université Paris Descartes. By 2030 there will be 30 million new cases of cancer diagnosed each year and 15 million people will die from the disease, according to Nikos Paragios, chief executive and technical officer at Therapanacea, a company built on research funded by the European Research Council (ERC). Some of those deaths can be prevented, Paragios says, through applying artificial intelligence to improve traditional radiation therapy, providing tools to tailor treatment to individual patients and to speed up clinical workflow, allowing more people to be treated in each radiology department. A mathematician by training, Paragios has applied a combination of machine learning, AI and high-performance computing to build software that makes radiation therapy more targeted and more effective in killing tumour cells. Therapanacea’s software and data analysis tools are integrated with existing medical devices. Radiation therapy is one of the main ways of treating cancer, a market worth €1.5 billion per annum. Paragios expects that Therapanacea’s products will reach five per cent market share by 2025. But the company has a long way to go to achieve that goal. First, it needs €2 million in investment, then it has to convince doctors to embrace the new technology. “The medical environment is very conservative and entering the culture of doctors is difficult,” said Paragios. 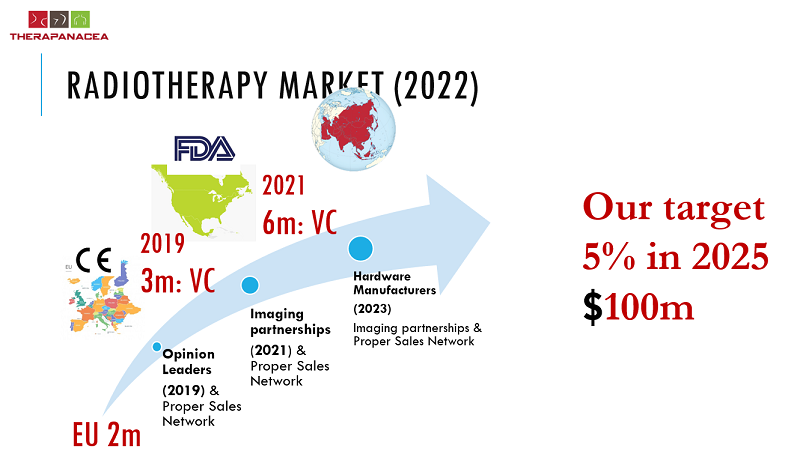 That is why, at least for now, Therapanacea is focusing on developing AI tools for automating existing manual processes to speed up cancer treatment. That will make a big difference for patients and doctors. Once the tools become widely accepted by doctors, “We will come with the disruptive products,” said Paragios. Paragios is one of a number of ERC-funded researchers who are about to move scientific breakthroughs from the lab to the market. Another is Paola Ceroni, chemistry professor at the University of Bologna is looking to spin off the results of her research on silicon nanocrystals. The technology can be used in bioimaging and light-guided surgery. “We get high resolution imaging at 20 times less than the cost of regular imaging,” said Ceroni. Evgeny Rebrov, professor of chemical engineering at Warwick University and chief technical officer of Stolicatalysts, pitched his business idea for making bespoke catalyst-coated tube reactors for use in manufacturing fine chemicals. Jennifer McElwain, professor of paleobiology and paleoecology at Trinity College Dublin, is decoding the sensing capacity of plants in a bid to improve precision agriculture and horticulture. McElwain is about to patent a “Plant Sense Kit” that will provide farmers and growers with more accurate sensors for use in greenhouses and fields, enabling them to get a precise understand how the environment is changing and how it is affecting their plants. Many innovations arise from publicly-funded blue sky research. But scaling up from a research project to a successful business requires more than just public grants. “Public money will not drive innovation very quickly,” Klaus de Bock, vice president of the ERC’s scientific council, told researchers at the meeting. “Try to involve private money,” he said. Most start-ups do not have the time to compete for public grants anyway, let alone winning them, believes Rachel Carey, chief scientist at venture capital firm Zinc. Venture capital funds can help promising ideas to reach the market by offering, “a safe space to experiment,” she said. The bulk of innovation happens outside public programmes. Companies need private capital, not public grants, to speed commercialisation, said Ronald De Bruin director of COST Association. “If a company relies on public funds, something is wrong,” he said.